Robots, just like toddlers, are capable of using a little help as they learn how to function in the physical world. A Rice University program, focusing on this aspect, slightly guides robots toward the most obliging, human-like ways in order to collaborate on tasks. A paper on their research has been published in IEEE Explore. “Historically, the role of robots was to take over the mundane tasks we don’t want to do: manufacturing, assembly lines, welding, painting,” said Marcia O’Malley, a professor of mechanical engineering, electrical and computer engineering and computer science. “As we become more willing to share personal information with technology, like the way my watch records how many steps I take, that technology moves into embodied hardware as well. Robots are already in our homes vacuuming or controlling our thermostats or mowing the lawn. There are all sorts of ways technology permeates our lives. I already talk to Alexa in the kitchen, so why not also have machines we can physically collaborate with? A lot of our work is about making human-robot interactions safe. The researchers explain that robots modified to respond to physical human-robot interaction (pHRI) conventionally treat such interactions as disturbances and then resume their original behaviors when the interactions come to an end. The Rice researchers have improved pHRI with a method that allows humans to physically modify a robot’s trajectory in real time. The most central part of the program refers to the concept of impedance control, literally considered to be a way for managing what happens when push comes to shove. A robot that permits impedance control via physical input alters its programmed trajectory in order to respond but comes back to its initial trajectory when the input come to an ends. The Rice algorithm is constructed on this concept as it allows the robot to modify its path beyond the input and then calculate a new route to its goal, something similar to a GPS system capable of recalculating the route to its destination when a driver fails to take a turn. The robot, in impedance mode, steadily returned to its original trajectory following an interaction. The feedback modified the robot’s state at the time of interaction and also modified how it proceeded to the goal in learning mode, Losey said. If the user directed the robot to prevent the cup from moving over the keyboard, for example, it would continue to do so in the future. “By our replanning the robot’s desired trajectory after each new observation, the robot was able to generate behavior that matches the human’s preference,” he said. Additional tests employed 10 Rice students who employed the OpenWrist, the O’Malley lab’s rehabilitative force-feedback robot, in order to manipulate a cursor around obstacles on a computer screen and then land on a blue dot. The tests initially used standard impedance control and then used impedance control with physically interactive trajectory deformation, an analog of pHRI that permitted the students to train the device in order to learn new trajectories. The results demonstrated that trials with trajectory deformation were physically simpler and needed significantly less interaction in order to achieve the goal. 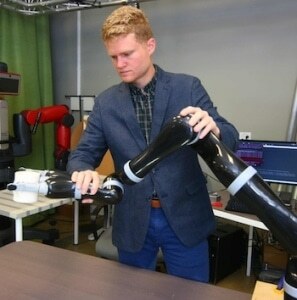 The experiments demonstrated that interactions will be able to program otherwise-autonomous robots that have a number of degrees of freedom, in this case referring to flexing an arm and rotating a wrist. One existing limitation refers to the fact that pHRI cannot yet adjust the amount of time it takes a robot to carry out a task, however, that is on the Rice team’s agenda. The paradigm shift in this work is that instead of treating a human as a random disturbance, the robot should treat the human as a rational being who has a reason to interact and is trying to convey something important. The robot shouldn’t just try to get out of the way. It should learn what’s going on and do its job better.